by Julia Kauffman, Mark Beach. Herald Press, 2006. At a time when childhood obesity and other diet-related health hazards are on the rise, this book seeks to restore a right relationship between children and their food, from garden to table. 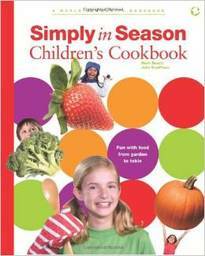 Aimed at children ages 6-12, with appropriate assistance from adults, this artfully illustrated and wholly engaging volume offers recipes using seasonally available produce. The book, commissioned by the Mennonite Central Committee, is organized by seasons, with each section including recipes for an entire meal. As with its predecessor publication for adults, this edition offers wisdom, information and inspiration along with its recipes. For example, “In the garden” explains what is happening in the garden during each season, including what tasks need to be done and what tools to use. Note that the seasons and produce featured in this cookbook assume a “four-season” climate and, as such, may not be practical for those who live in other climates.